Snapchat is always adding little bits and pieces to just make their app brighter and more attractive to their mostly teenage user base. The latest addition is stickers, which might not sound like much to write home about but could be very fun. Usually, Facebook is trying to copy Snapchat and not the other way around, but not this time. There have been stickers available on Facebook Messenger for a long while now and they are one of the most popular aspects of the app. 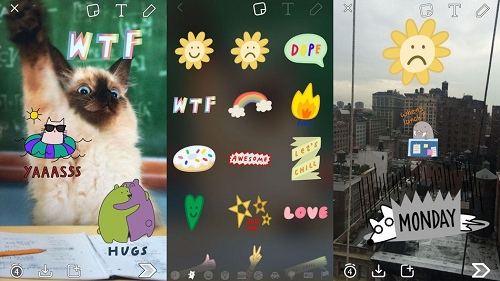 Snapchat before this allowed you to doodle and to stick emoji onto videos, but they didn't have stickers like this. These are like most of the stickers available on apps. There are food and animals and things with some references some adults might not get about the bae among other things. They look very fun even if some of the artwork isn't great looking. These stickers can be added onto normal photos or they can be used like the emoji in videos. They probably wouldn't look the same as the emoji do if you tried to attach them to something in a video. but you know people are going to enjoy this. Snapchat is great because it is a very personalised messaging app. You can add people easily and follow celebrities or brands without it feeling too invasive. Most of what you send will be private and every now and then you might love a picture enough to put it in your story and make it public. These stickers can help push or create an inside joke, it can make it easier to say something rather than typing it out and it's just a lot of fun that adds to that personalised experience. Now I'm starting to wonder what Snapchat could actually do next to improve the experience for their users further. You can do pretty much everything you already want to do on there, but Snapchat is bound to still have improvements in the works. If you want to access these new stickers, then make sure your Snapchat is updated first. Once it is you'll see a little square next time you take a photo. You can add as many stickers as you like then move and resize them. It can make your snaps a lot cuter so next time you use Snapchat, have some fun with stickers.